1.Wash the chicken cleanly, and cut out the fat skin chop-chop-chop with scissors Cut out the parts of neck and hip only..
2.After soaking the glutinous rice in the water for about 1hour, and drain it. 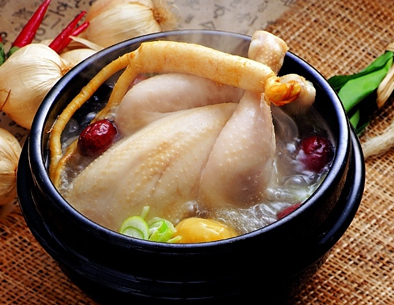 4.The prepared materials and the chicken are put into the pot and boiled hard. 5.After it is boiled hard, the salt and the minced small green onion are put into the soup, and the Samgyetang is completed. It can remove the smell of fat and can be tasty. gastritis, the stomach ulcer, toothache and skin disease, paralysis etc. Especially, it is said that eating it with chicken has good effects for the arthritis and lumbago . There is a word that the sharp-pointed thorn of the branch has good effect to drive the evil out.